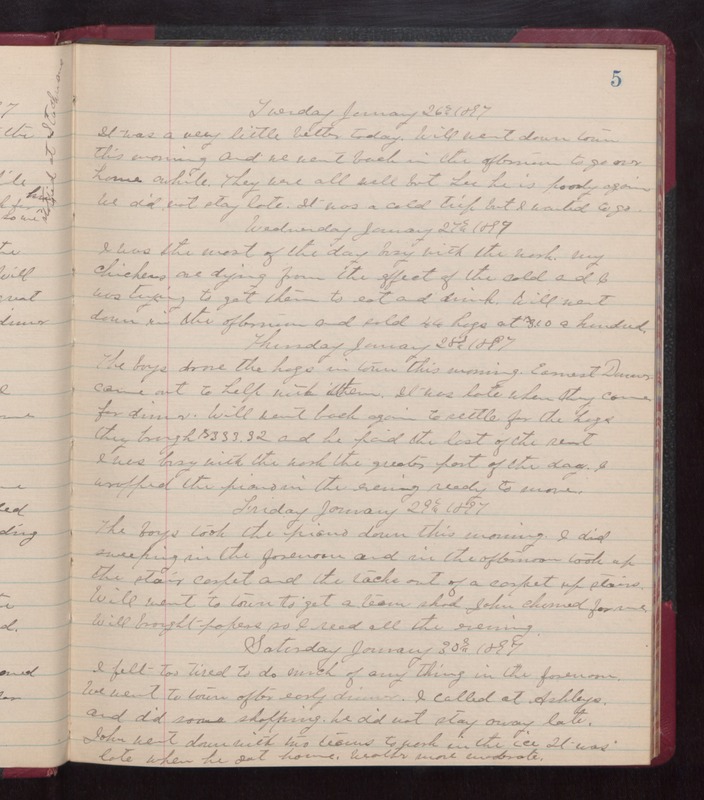 Tuesday January 26th 1897 It was a very little better today. Will went down town this morning and we went back in the afternoon to go over home awhile. They were all well but Lee he is poorly again We did not stay late. It was a cold trip but I wanted to go. Wednesday January 27th 1897 I was the most of the day with the work. My chickens are dying from the effect of the cold and I was trying to get them to eat and drink. Will went down in the afternoon and sold 44 hogs at [$? ]3.10 a hundred Thursday January 28th 1897 The boys drove the hogs in town this evening. Earnest Duncan came out to help with them. It was late when they came for dinner. Will went back again to settle for the hogs. They brought $333.32 and he paid the last of the rent. I was busy with the work the greater part of the day. I wrapped the piano in the evening ready to move. Friday January 29th 1897 The boys took the piano down this morning. I did sweeping in the forenoon and in the afternoon took up the stair carpet and the tacks out of a carpet up stairs. Will went to town to get a team shod. John churned for me. Will brought papers so I read all the evening. Saturday January 30th 1897 I felt too tired to do much of any thing in the forenoon. We went to town after early dinner. I called at Ashleys, and did some shopping. We did not stay away late. John went down with his two teams to work in the ice. It was late when he got home. Weather more moderate.